Retrospective 30 official photo (I am not with my camera to take photo of my bag). 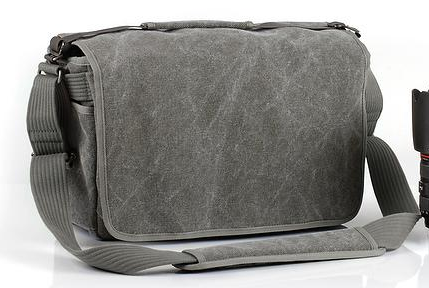 This is a review of the ThinkTank Photo messenger bag: the Retrospective 30. A small disclaimer: I am not a professional photographer, I have ties to ThinkTank Photo (personal and through the affiliate program) and I will be reviewing this bag primarily as a messenger bag, not a camera bag. I received my Retrospective 30 in the pinestone material around the launch of the bag last year and have been using it daily ever since. Prior to the bag I used either a Timbuk2 bag or a Jandd backpack. Despite being told otherwise the bag fits my fifteen inch MacBook Pro in its neoprene sleeve without a problem. Granted this removed the nice squishy aspect of the bag but it does transform it into a stylish laptop bag. The remaining space in the main compartment can various combinations of things. Usually I carry a book (trade paperback to large hardcovers) and a lunch (fruit and a sandwich). It can also fit a binder or notebook in addition to the book/lunch combo. There are inside pockets that fit miscellaneous things like pens, iPods, cables, chapstick, memory stick, small flashlight and lens cleaning cloth. Even though it is an open pocket (there is a velcro flap for the concerned) I have only had things spill out on one or two occasions. On the outside of the main compartments are two large velcro pockets. For me I have one these constantly filled up by the custom fitted rain fly, a necessity in Seattle. The other pocket rotates between a laptop charge, random things for the day, a sandwich (in case the main pocket cannot contain a sandwich) or, if the mood arises, my Nikon D60 with a 50mm lens. They all fit well without making the bag feel too bulky. Though with all the pockets filled and a laptop it can get fairly hefty. Speaking of heft, the main strap is nicely padded with grippies to prevent sliding. The pad itself slides but not very easily so it will remain in the set place when taking the bag on and off. Oh, the main flap also velcros down onto the same large velcro pads as the big front pockets. However this is where a really neat feature of the bag comes into play. Each of the velcro strips has an additionally silencer strip. Essentially a complementary velcro section that can be put into place to prevent the velcro from making contact, effectively silencing the bag. Personally, I use the the velcro for the main pockets in the front and use the silencer for the large main flap. The only time I velcro the main flap is when I am in a really crowded area such as Pike’s Place Market, a conference or a packed bus. There is also a thin zippered pocket on the body side of the bag. For the first six months I thought this was a useless pocket with no real design purpose. Then when the rain season started again I had the rain fly on and realized that I could still access that pocket. This then became temporary book storage when scuttling from bus shelter to bus in the pouring rain. On the sides are pockets presumably for water bottles or maybe cellphones. With the laptop always in there I am never able to use the pockets but I am sure they have a purpose. Right above the pockets are thick straps, the use for these on my bag is to hold a carabiner clip which then occasionally holds on umbrella or grocery bag when waiting for a bus. Overall I really like this bag a lot more then my other bags and even better then my Streetwalker bag. If I am going someplace with camera gear it is in this bag, if I am going somewhere with a laptop it is in this bag, if I am going to work it is with this bag. It began on a sunny summer day in Santa Barbara. October had just begun, not a cloud flew free in the skies, a light breeze from the ocean blew down the street as I walked into the bicycle shop. I was nervous, this was the first time I was doing this on my own. The weeks leading up to this day I had gone out a few times with the university cycling team. I felt I had found a sport that I could thoroughly, going around on my mountain bike, struggling to keep up, I knew I just needed a good road bike to make it all come together. In the store I had a list of several potential bike my Dad, who had owned a bike store for eleven year, had given me. I told the sales guy that I was looking to buy a new road bike and that I was joining the UCSB cycling team (there was a discount), I also said that I was thinking of these bikes. He assumed that since I was thinking of joining the cycling team that I needed a really fast competition level bike, I of course did not know this at the time. Instead of getting a more entry level road bike I wound up with a more serious bike. I was also sold some accessories that I probably did not need. I put on my freshly purchase cycling gear, cinched down my backpack and took off back towards campus on my shiny red bike. I was still nervous and a touch shaken up by making such a big purchase, the biggest I have ever made up to that point in fact. But I rode on, enjoying the lovely fall day, using the dedicated bike paths, this just felt right. For the next few weeks I took care of my bike, keeping it clean, taking it out and biking around. I fell down a few times as I adjusted to clip in pedals. One time I came to a stop at a stop sign and could not unclip my shoes, I slowly tipped over onto the concrete. No one was around to see me. Halloween weekend rolled around and the club had an outing. It was a morning ride that was to last into early afternoon. In the afternoon I had a study session planned for an upcoming paper that was due in my comparative literature class. Halfway through the bike ride we came to a T intersection. Right took us back to campus and left onward to Hope Ranch. I felt that it was getting late and I should head back to campus for my study session. But I thought that might be rude, leaving mid-ride. I was not yet confident enough in myself to be that independent. I went left with everyone else. It was a steady climb up to the top of the small sea-side cliff, I was getting pretty winded as I fell behind. I realized I should have turned back. But then we started going downhill, downhill? Easy. Trying to catch up I sped up down the big hill, a gentle turn was coming up. I checked my speedometer, 32 MPH, pretty fast. On my right the ocean spread out under a blue sky, just beautiful. It was not a gentle turn. It was a hairpin turn that I did not know about. I tried to break and make the turn. I could not make. Some unconscious part of my mind must have realized the options: slide out or hit the railing and plunge a hundred feet into the sea. I started to slide out. I just remember that moment of tilting downward. Next thing I knew I was on my back with people over me. They said an ambulance had been called. I wiggled my toes and fingers, all working, good. Next I asked if my glasses and bike were okay, they said they were. Someone had my glasses and they took my bike as an ambulance arrived. In the ambulance they asked what hurt the most. I managed to reply “My pride”. They did not laugh, I thought it was funny. In the hospital they cleaned a gash on my leg, from the bike spokes as the bike flipped over me. The only other injury was my front teeth, it seems I used them to break. A little lost without my glasses (someone had them) I called my roommate asking for help. He found someone in the hall with a car and picked me up. The next day I got my glasses and bike back from a cycling club member. I was heartbroken at seeing my bike scratched up. I spent the next few weeks recovering, not really biking anywhere. I went to the doctors and started a long procedure to get crown’s made to replace my lost teeth. Throughout that year I tried several times to get back into cycling but I could not enjoy it. I still rode my mountain bike around campus but the road bike became a source of regret. I could not get back on. This all happened within the first few months of my freshman year. Sophomore year I brought my bike back to school and tried riding it again to no avail. I could not ride it but I could not sell it, I felt I had invested too much into the whole enterprise. Junior year I spent in Scotland while my bike rested in my parents garage. Senior year it remained in the garage while I found a more appropriate physical pursuit in fencing. Then I moved to Seattle for graduate school. 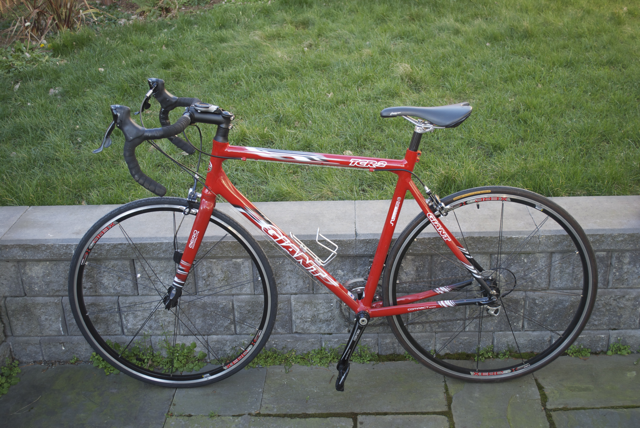 Okay, alright, now was the time for me to dust off this bike and get back into the cycling game. I could even use it to commute to campus now that I lived a few miles away, Seattle is bike friendly this is perfect!I rode it a few times around Greenlake before realizing it was not to be. I considered converting it into a commuter bike, I even went into a local bike shop to check out panniers. Then winter came and my ideas of commuting to work fell to the wayside. I had to sell the bike. I pulled it out of storage, cleaned it off and looked at it. I replaced it all back to stock parts, removed the speedometer that fatefully read that final speed, made sure the scratches were at least cleaned up, took a few photos and posted to craigslist. I started posting four weeks ago. I sold it this weekend. I now feel a bike shaped hole in my life. When I had someone coming by to look at it. I felt all of the potential that it represented, an entire new aspect of myself unexplored, lost, gone. A UCSB alumni ended up buying the bike from me, that helped make the loss a little bit easier. Making that single left turn drastically altered the course of my life. I have always wondered what would have happened if I turned right. 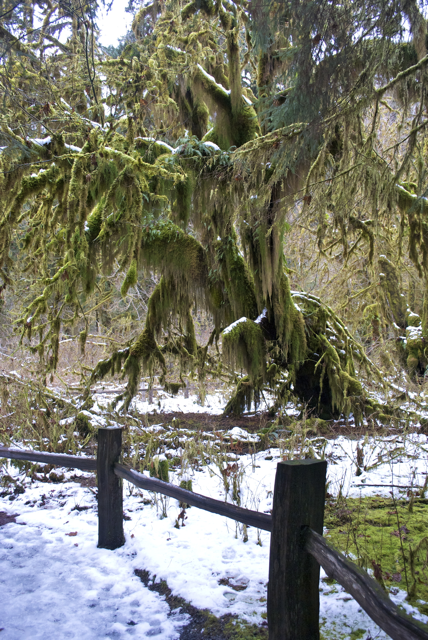 Hall of Mosses, not to be confused with the Halls of Moses. Is it at this point I believe I am supposed to apologize for not writing for the past year and a bit. However I am not sorry, not one bit. In fact I have looked at the pageviews since I stopped writing: they have not significantly changed! That means I may have had a handful of people actually reading consistently but by and large most of the views were from random people stumbling onto my blog. On the plus side I have received the occasional check from ThinkTank Photo from that handy link on the side of my page (which has been updated). And I don’t feel bad about having it! People who utilize can get a a free bag and I get a referral fee, a win-win situation. Anyway, so why am I posting again? Well I have found myself writing less and less of late, namely due to increased class load (all done now!). I tried the website 750words.com for the months of November and December and that filled some niche need of writing but then I dropped it. I am really starting again because my girlfriend, Leah, has started a blog herself and if we both do it then we are more likely to actually write, the beauty of peer pressure. I am also hoping this will pressure me into taking pictures again, something in which I have greatly fallen behind.